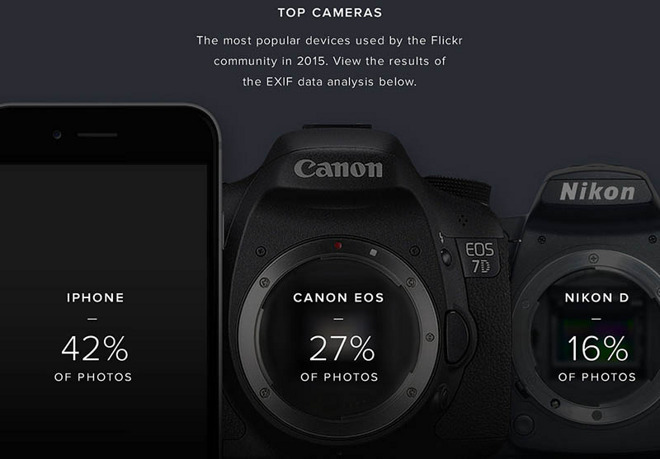 The iPhone 6 and the iPhone 5s were by far the most popular cameras on Flickr during 2015, the photo-sharing service announced during its regular Year in Review feature. All together iPhones were used by 42 percent of photographers posting to Flickr, according to gathered EXIF metadata. Canon DSLRs accounted for 27 percent, while Nikon DSLRs managed 16 percent. Combined, 39 percent of photos and videos were shot with some form of camera-equipped phone. After the iPhone 6 and 5s, however, there was a rapid dropoff in device popularity, with the iPhone 5, iPhone 6 Plus, and Samsung Galaxy S5 vying for third place. iPhones have enjoyed dominance on Flickr for some time, a consequence of the popularity of Apple devices and the higher likelihood of someone having a smartphone with them rather than a dedicated camera. Point-and-shoot cameras have largely faded into the background as smartphones have narrowed the middleground between them and DSLRs. They were however used to capture 25 percent of Flickr's photos and videos this year, with Sony's RX100 being the top model.